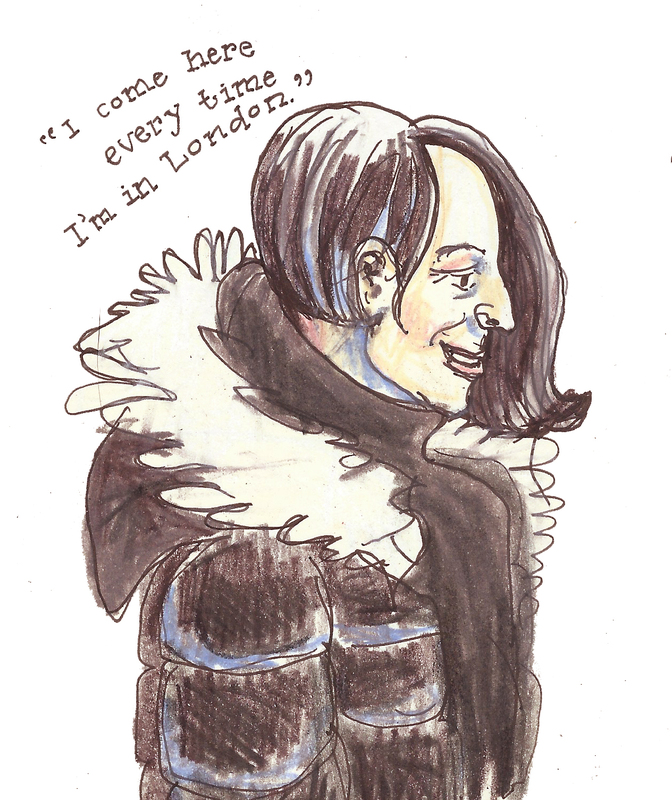 Yesterday, I had the very singular experience of sitting in the London Gudrun Sjödén shop, sketching away while customers came to greet Gudrun herself, who was in town for a flying visit. As I listened to the women who queued up to speak to Gudrun, and as I chatted to her in between times, it became clear to me what a feat the Gudrun label represents. Most of the women had one pressing sentiment to impart: a big, resounding ‘thank you’, for recognising that women come in all shapes and sizes, and that we need not stop wearing colour and pattern once we’re over a certain age. 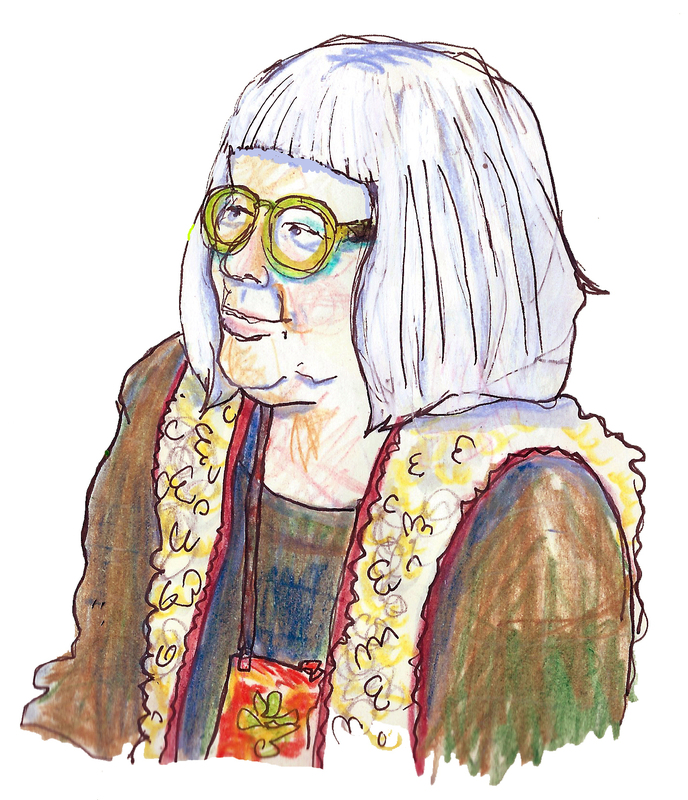 Gudrun, with her trademark bright green specs was one manifestation of that spirit; another was the broad range of ages who approached the table for a biscuit and perhaps a photograph. Old or young, slender or not, the customers all wore colour, and wore it boldly. 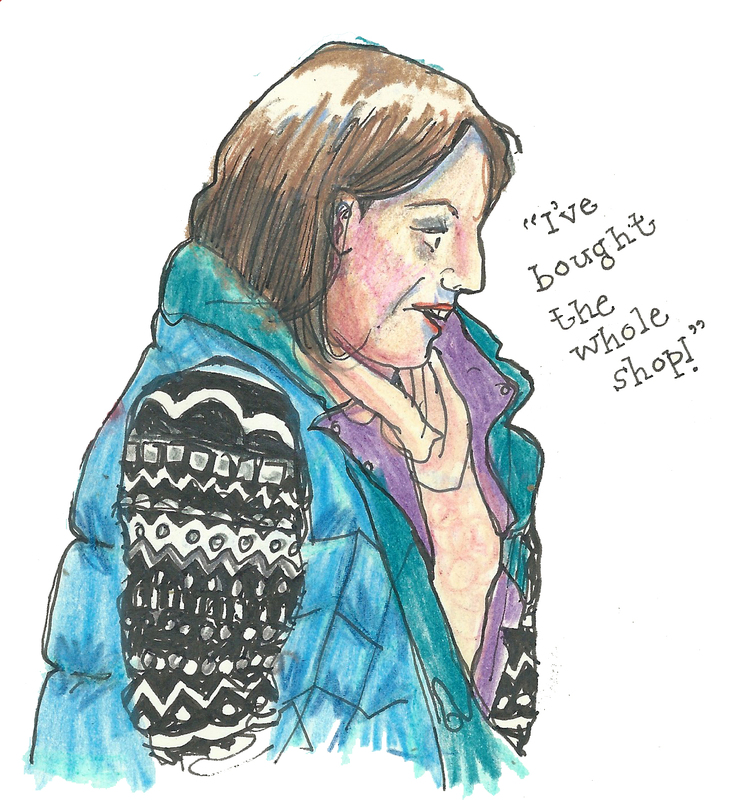 It made for some interesting drawing (so would the shop itself: the colourful clothes all around, the artwork and lampshades, and the glorious coterie of shop staff provided almost too many potential subjects). I was glad to have a moment to thank Gudrun for including older women in her catalogues, and catering for women no matter what size they are. 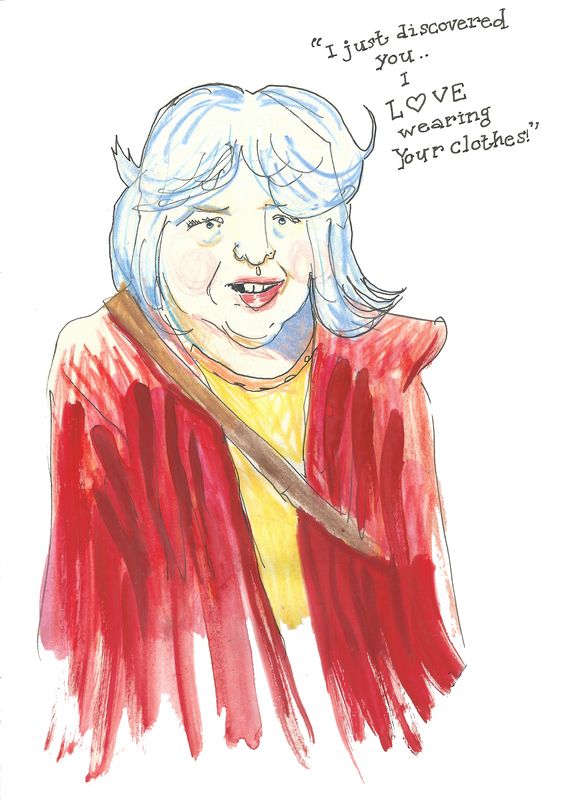 It’s one of my personal bugbears that anyone who is a different shape from straight up-and-down has to look at photographs of clothes online or in catalogues, an then do a kind of tricky mental leap to translate that into what it would look like on them. “It’s what’s inside that counts”, said Gudrun at one point. She was talking to Amanda from the Womens’ Room blog, who had popped in to do an interview. I like the Women’s Room’s premise, too – that women over 35 just aren’t catered for by mainstream clothes shops, and that that’s a jolt for women who have grown up expecting to be able to express themselves through fashion. It’s probably a strategic business error, as well, if the women I saw yesterday are anything to go by. Put it this way: these people are not gracefully sliding into an age of polyester twinsets. This couldn’t have been more strongly illustrated than by the woman I sat opposite on the train back to Brighton. 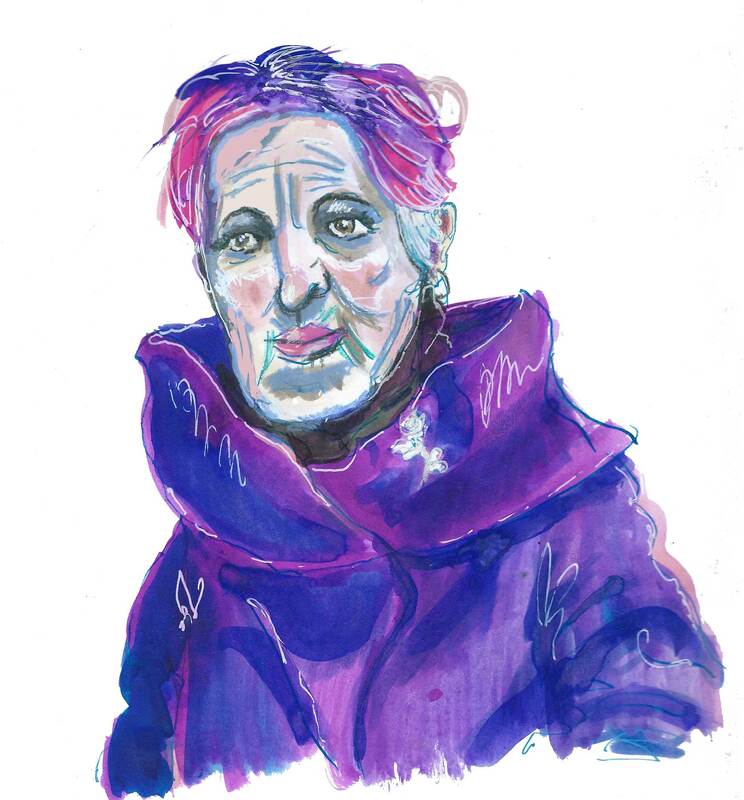 In her seventies, or perhaps even her eighties, she sported a shock of snow white hair onto which she’d splurged a mix of bright pink and purple dyes. She looked magnificent. A note about the drawings: In the end I took pencil crayons, which allowed me to make colourful marks, quickly and without mess. I haven’t used them for a long time, and it was good to rediscover some of their plus points, like how nicely the colours can blend. 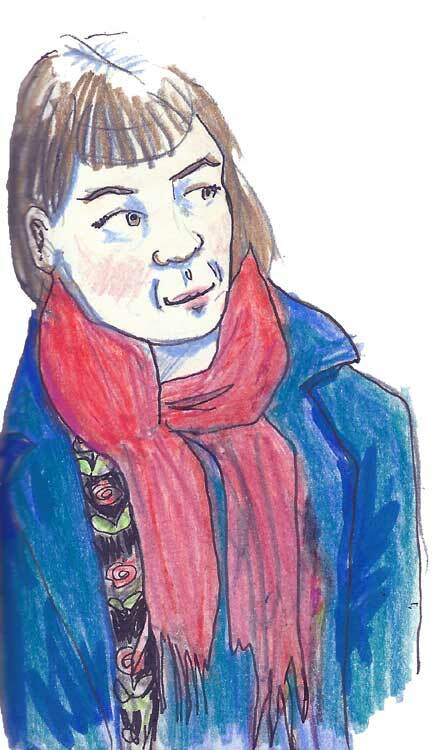 Drawing people as they quickly came to say hello was difficult, so I have not tried for exact likenesses. 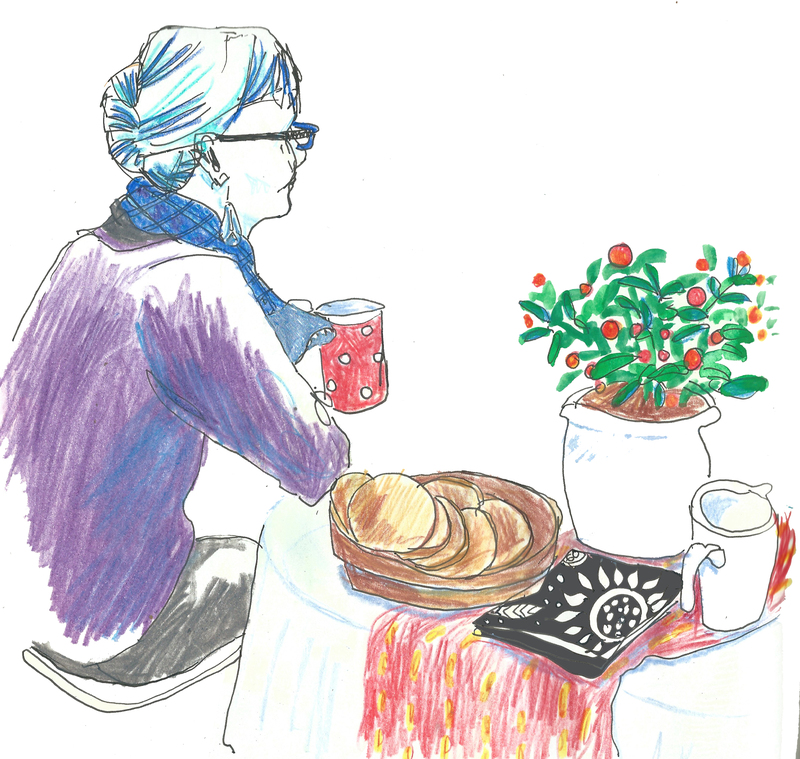 In most cases, I was drawing and colouring in long after the customer had departed, so colours and details are often from memory, or completely made up. 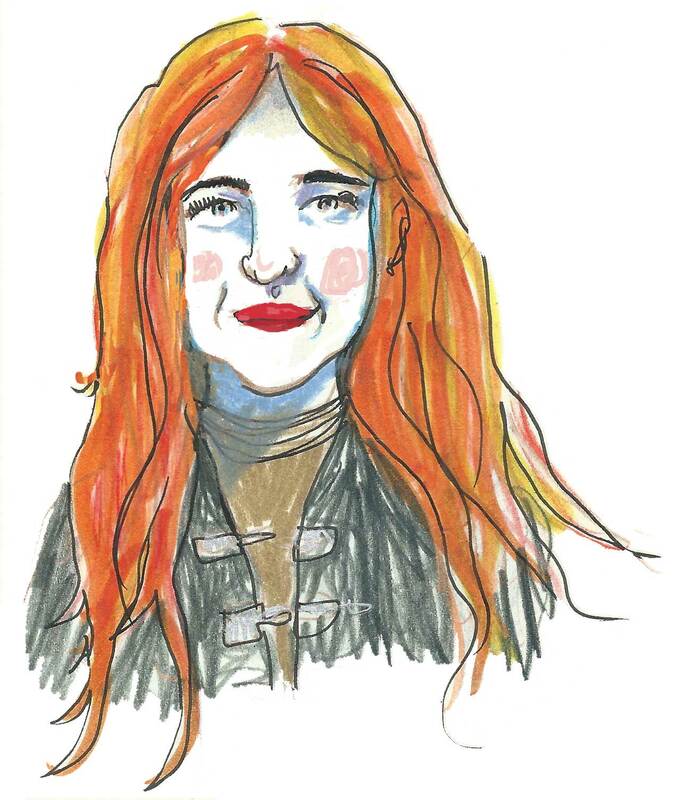 Please don’t feel offended if you see an unflattering rendition of yourself – chances are I’ve mixed you in with one or two other people! Likewise, I’ve mixed and matched the things I heard people saying to Gudrun, so they probably aren’t next to the people who actually said them. Wow Myf – the girl done good !! 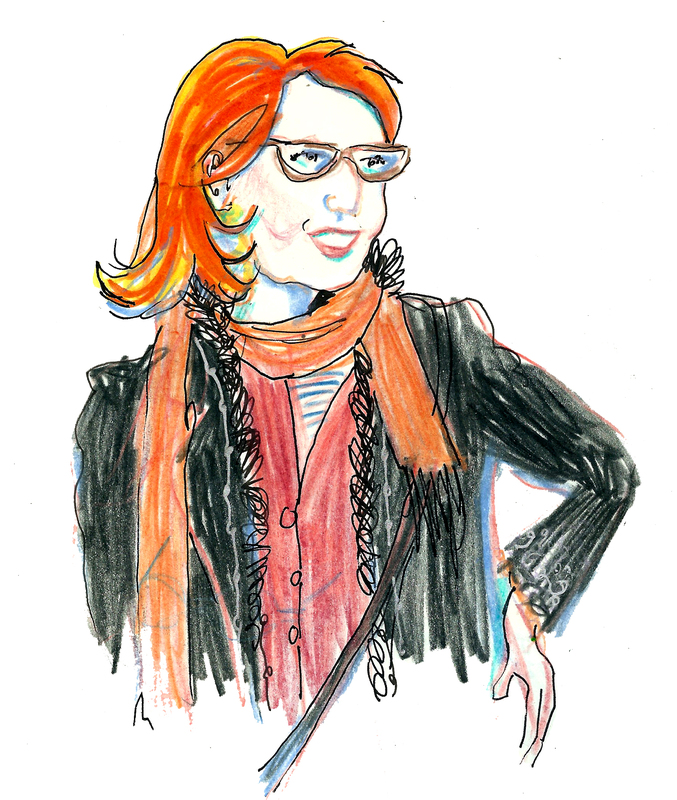 Such a skill – to get a likeness in a moment. Do you have any dodgy sketches that you scrapped, at all ?! 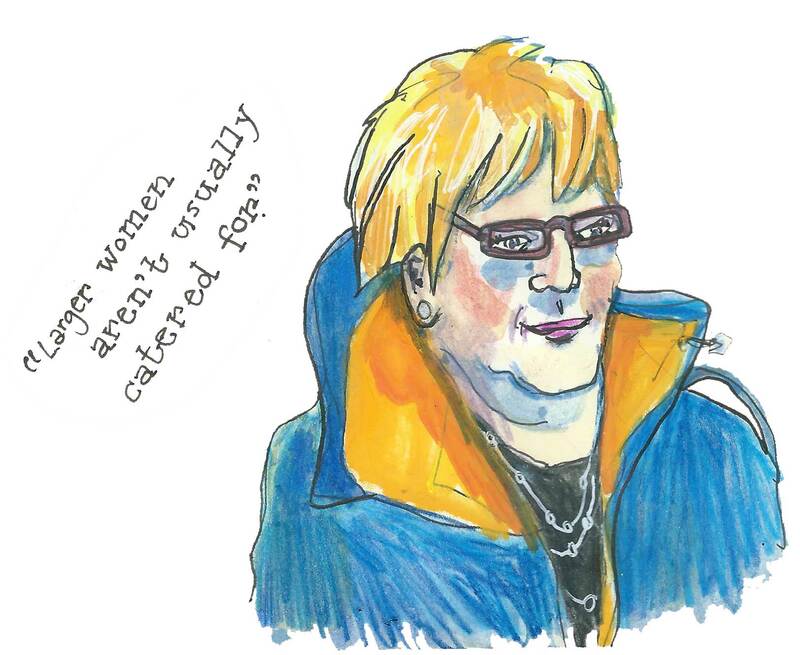 The drawings do speak of what you saw – these are some sassy ladies ! Thanks Lucy! 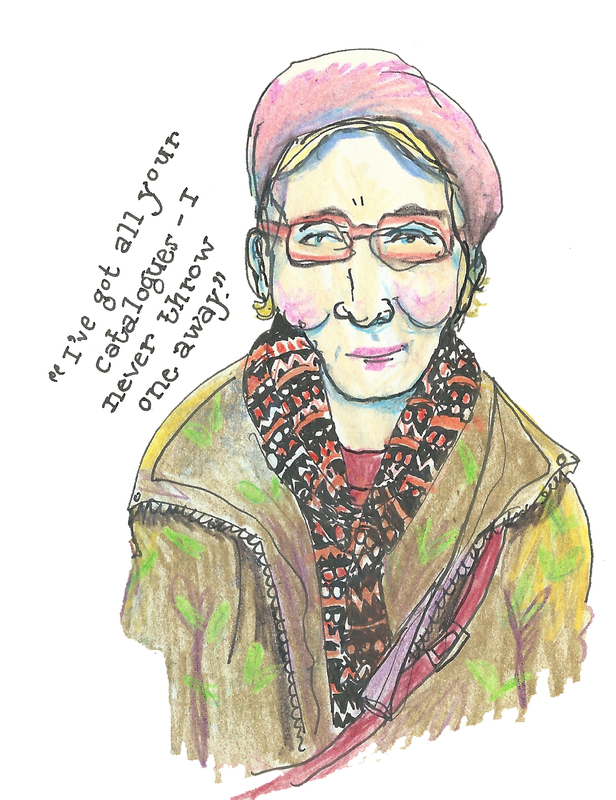 Oh yes, boy do I have some dodgy sketches… apart from anything else, there are the ones where I started drawing someone and they immediately left the shop, before I’d got any sense of what they were wearing. I wish I had seen that documentary, it sounds great. I was just reading this article on the blog I mention in the post, which mentions that programme at the end. (Ooh, I see it’s still available on 4OD!) Superb ladies. I do so hope I have that amount of pizazz at their age. I really like these. The humanity of the women really comes through. They are beautiful drawings! Ahhh thank you! Lots of red hair too, I couldn’t help noticing. 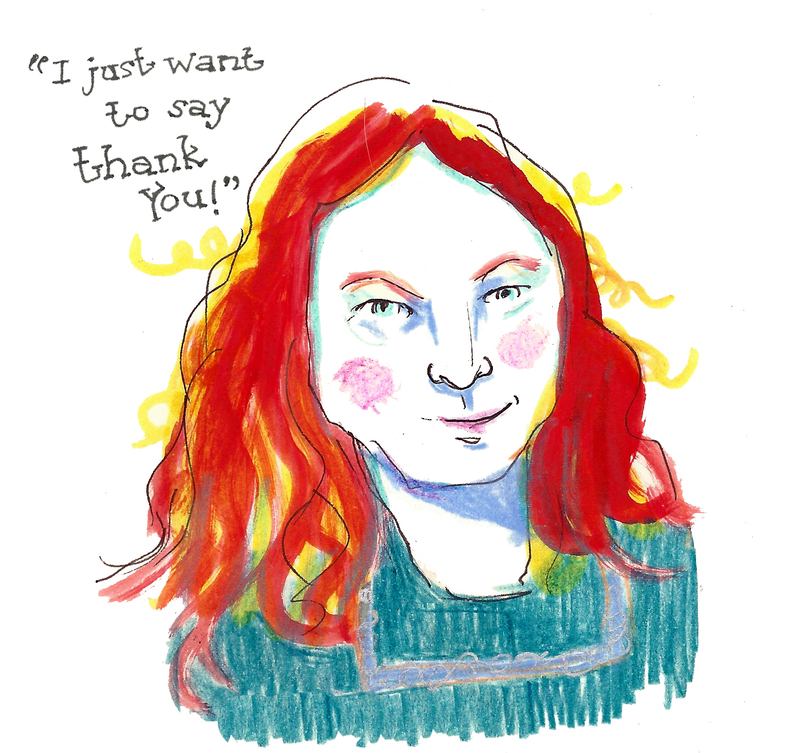 Your drawings are as colorful and beautiful as Gudrun’s clothes!